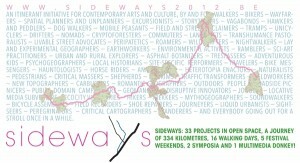 The backbone of the Sideways festival is a 4 week expedition through Belgium, from West to East, between August 17th and September 17th 2012. During the 5 festival weekends, the mobile laboratory takes a halt at 5 festival locations: Menen (19.8), Herzele (25-26.8), Brussels (1-2.9), Turnhout (8-9.9) and Zutendaal (15-16.9). Here, the different artistic trails are entwined into a knot of activity. These 5 festival locations host the actual festival programme: a series of performances, talks & walks, live art, site-specific interventions and walkshops!